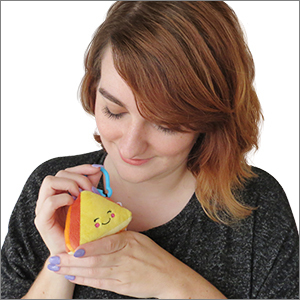 Micro Comfort Food Grilled Cheese: An Adorable Fuzzy Plush to Snurfle and Squeeze! There's not as much oozing cheese on this one as its larger counterparts, but it's adorable and cut on the diagonal, as all good grilled cheese should be. Also, the hook on the side means this micro has attitude!